The International Polar Foundation UK, together with polar scientists from the UK Polar Network, will bring an interactive science learning experience to the public and schools over the weekend 27-29th September 2014 at Dundee Science Centre in Scotland. 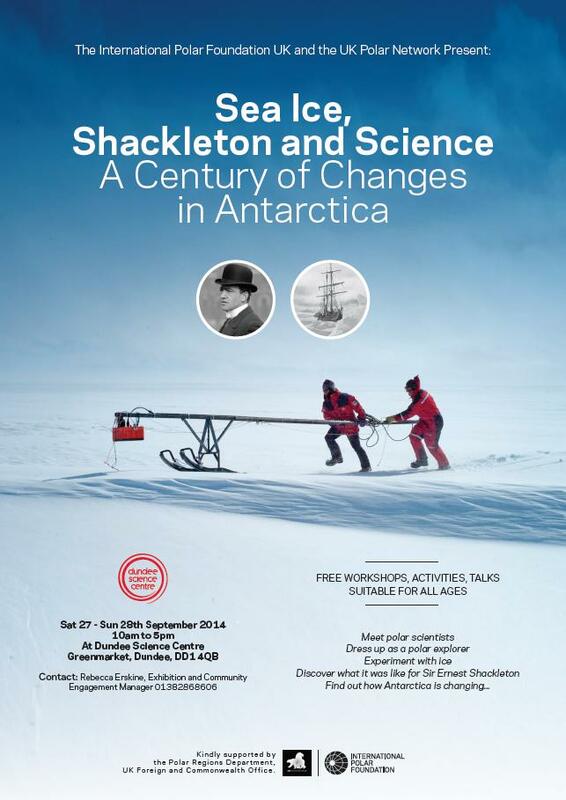 Shackleton, Sea Ice and Science: A Century of Science in Antarctica is the first of three 3-day polar science outreach events which will take place around the UK during 2014/15. The IPF polar puzzle will be used to bring the Antarctic to life and show Shackleton’s journey and discuss how it might be now due to climate changes. Participants can try on polar clothing similar to what Shackleton and his men might have worn during the 1914 expedition and compare it to modern-day clothing. They will then have the chance to become scientists by doing "hands on" experiments investigating climate change. Four scientists from the Scottish Association for Marine Science (SAMS), British Antarctic Survey, Aberdeen University and Edinburgh University will give short talks and "meet the scientist" discussions during each of the days and discuss how research techniques in their field of science have changed over the last hundred years. This will be a great chance to become fully immersed in polar science set in the exciting historical context of Shackleton's great endeavour a century ago.